Anthony Crolla is convinced it will be second time lucky when he challenges WBA lightweight champion Darleys Perez in Manchester on Saturday. Home fighter Crolla boxed his Colombian rival to a draw in July, although many observers thought he won the fight. Last December, 29-year-old Crolla suffered a fractured skull and broken ankle when he was attacked by burglars. "The old saying goes that 'the first time you go in believing, the second time you go in knowing'," said Crolla. "Last time out I was in with a world-class champion and I more than held my own. I believe I did enough to win the fight and proved I belong at that level. "Since the first fight I have developed as a boxer and a fighter and I have no doubts I'll bring that world title home. I know I have all the answers." As a result of last year's attack, Crolla missed out on a scheduled world title shot and at one point it appeared his career might be in doubt. But despite his remarkable recovery, Crolla says he does not want to be remembered as the man who overcame adversity and nearly won a world title. 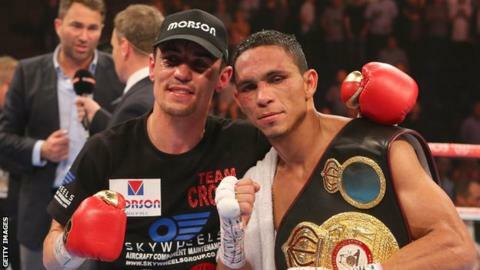 "They were lucky to get away with the belt last time and they may not be so lucky this time," said Crolla, who has 29 wins and four defeats from 36 professional fights. "I didn't watch the fight for a few months, I found it too hard. I have watched it back since and, although it doesn't get any easier, I think I can make it right on Saturday." Meanwhile, 32-year-old Perez, who has 32 wins and one defeat from 34 pro fights, says he has been preparing for "war" at the Manchester Arena.